Slowly smoked until it nearly falls apart and then smothered in a sweet and tangy sauce. Rosh Hashanah is one of my favorite Jewish holidays to cook for. Each year I look forward to the fall smells, sense of renewal, traditions and of course eating lots of apples and honey. Now that I live in Texas, I sadly do not always get to spend the New Year with my family back east. But I do always take the opportunity to dream up a new version of my favorite main dish – brisket. In Texas, brisket is BBQ king. Slowly smoked until it nearly falls apart and then smothered in a sweet and tangy sauce. I, of course, braise my brisket and enjoy feeding it to doubtful locals who are always won over by the tender meat and sweeter accompanying sauce. Plus, no special equipment besides an oven required! I have wanted to try to create a pomegranate brisket for some time as a nod to the Rosh Hoshanah tradition to eat fruit that has just recently come into season. The pomegranate is often used for this purpose! Pomegranates are a little tricky to find in Texas, but the juice is plentiful and makes a perfect braising liquid. Served with pan juices and a crunchy, fresh succotash, this brisket is a new spin on an old favorite. If you have access to pomegranates, feel free to replace the dried cranberries with fresh pomegranate arils. This recipe can be doubled to feed a crowd, but remember the cooking time will be longer too. Amy Kritzer is a food writer and recipe developer in Austin, TX who enjoys cooking, theme parties and cowboys. She challenges herself to put a spin on her grandmother’s traditional Jewish recipes and blogs about her endeavors at What Jew Wanna Eat. You can follow her on Twitter and Facebook and watch her cooking videos on Google+. Season brisket on all sides with salt and pepper. In a large Dutch oven or oven-safe pot, heat the grapeseed oil over medium-high heat and brown the brisket on all sides, or about 5 minutes per side. Remove the brisket to rest, and add in onions and garlic. Sauté until browned, about 5 minutes. Add brisket back in over the vegetables fat side down and cover with pomegranate juice, red wine, and enough chicken broth so the brisket is covered about ¾ of the way. Add in rosemary and thyme. Cover the brisket and braise in the pre-heated oven for 3- 3.5 hours or until fork tender. Once cooked, remove brisket to rest and heat pan juices over medium- high heat until reduced by at least half and sauce is thickened. Strain and add salt and pepper if needed. In a bowl, combine corn and cranberries. In a separate bowl, whisk together extra virgin olive oil, honey, and red wine vinegar. Toss with corn mixture and add in cilantro and salt to taste. 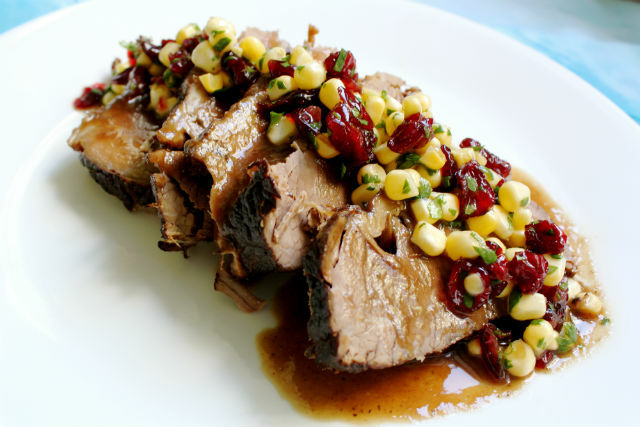 Once brisket has cooled, sliced against the grain and top with sauce and succotash. It is best reheated in a 200 degree F oven covered in its sauce to retain moisture. Enjoy!